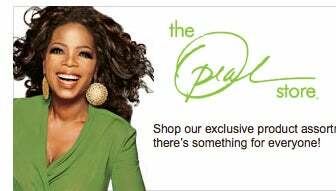 The Oprah Store is now online! In a video tour, Oprah explains that since 600 people line up everyday to watch a taping of her show, she always wanted a place where "they could just get a keychain or something." Of course, Oprah being Oprah, things are never that simple. The brick-and-mortar store is 5,500 square feet of items, each approved by Ms. Winfrey. The clothes come in every size from small to 3x. Dressing rooms are in soothing colors with a flattering mirror, "no fat mirrors allowed." There's an entire section devoted to tea. Lots of items, including the gift wrap, are "new grass green," Oprah's fave color. And most everything in the Chicago store can now be found online. Baby bibs, bowls, puppy polos and South African crafts, after the jump.First: Unless your name is Olivia, Ophelia, Obama, Odetta or, of course, Oprah, you may not find it exciting that nearly everything Oprah sells has an O on it. At first it was extremely distracting. Then you get used to it. Onward! First stop: O Baby. There are cute sets you could pick up if you're going to a baby shower. These bibs are bestsellers, Oprah says. These are a lot funnier, don't you think? The critters on this tee aren't just random; they're animals found in South Africa. Oprah has a vision! While the puppy polo is cute, it just makes a lot more sense if your dog's name is Oscar, or Oakley. When the Os make a pattern, like on this leash, they're less Obnoxious. The apparel for women consists of lots and lots of workout wear. Three different kinds of yoga pants, all kinds of hoodies and sweatshirts, and almost everything has a tiny embroidered O. Obese? No excuse! …Which are either inspirational or rather demanding, depending on your mood. Oprah has an entire section called "cashmere." This sweater comes in sizes up to XXXL, which almost never happens with cashmere, so that's great. The O logo? Not so great, when the sweater is $120. I can't believe I'm saying this, but, I might buy this sweater. It's just so freakin' cute! Cashmere, with rouched sleeves. And look ma, no logo! For men, Oprah offers Harpo logo tees, which is just not ever going to happen. Catch on, I mean. Never. Ties seem more likely: You can't even tell there a million tiny Os on each one. The "Home Living" section has some really gorgeous items, like these handcrafted beaded glass bowls. They're from Sizwe Umoya, a group of rural Zulu wire-weavers in South Africa. Oprah is soooo on-message. These baskets are also handcrafted, but I'm just going to go ahead and say it: Meh. I might buy this pillow, Oprah. Okay? Winning me over. Oprah loves tea, so there are plenty of teapots, trays, dessert plates, cups and mugs to choose from. Still, only the Obamas, O'Connors and Onassises should have O teapots. This O tray is pretty damn cute. And the colorful acrylic glasses are perfect for cocktails by the pool. Not that I have a pool. Oprah says this makeup bag is a top-seller. The logo starts to grow on you after a while. Like fungus. These makeup bags are even better: Metallic is chic, and the logo's been reduced to a mere zipper pull. Subtle! Ladies and gentlemen, Oprah luggage. For traveling to Ontario, Oman, or, oh, Ohio. For some reason, this piece of luggage seems even worse than the others. At least the previous ones had a sense of humor. An Oprah nOtebook makes sense somehow. The keychain that started it all!